Stop it quickly with your finger, and then release it. Try with the other egg. When you stop the hard boiled egg it just stops. When you touch the raw egg it stops, but if you let go again quickly it will start moving again. So you can tell it's raw. The centre of a raw egg is quite liquid so even if you stop the shell moving the centre will keep going for a short time. When the egg is spinning the centre of the egg is moving with the outside. 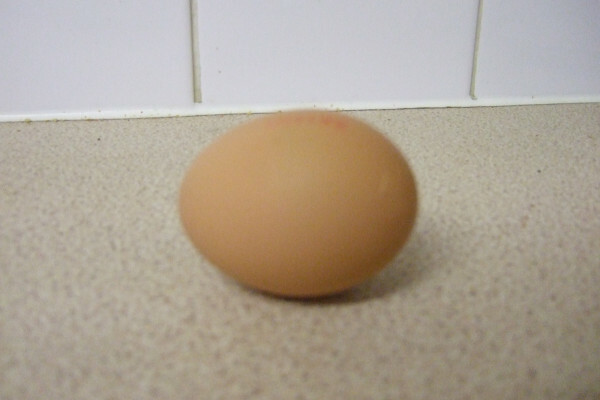 If you stop the egg quickly, you only stop the shell of the egg so the liquid centre will keep on moving. If you let go the friction between the centre and the shell will start the shell moving again. A hard boiled egg on the other hand is solid so if the shell is stopped so is the centre. The hard boiled egg is solid so moves as one piece. So when it stops it all stops. Why was the raw egg so difficult to start spinning? In the same way that it is hard to stop the egg because the centre is liquid, it is hard to start it moving quickly. So even if you spin the shell very quickly the centre will not be moving, so it the shell will quickly be slowed by the friction between it and the centre. Next Make an Egg Stand on End.